We are in the Easter Seals Crossroads building located at 52nd and Keystone Avenue. Our location is just south of Glendale Mall. Our physical address is 4740 Kingsway Drive, Indianapolis, IN 46205. We are located on the 3rd floor in the “Speech and Hearing Resource Center”. From I465, go SOUTH from the Keystone Avenue exit. Take Keystone Avenue to 52nd Street. Turn LEFT. Turn RIGHT onto Penwood Drive. Turn RIGHT (when it deadends) onto Kingsway Drive. Take Kingsway Drive until you see the Easter Seals Crossroads building on your right. Once you enter the building, please sign in at the front desk. Go to the 3rd floor via the elevator. Once you exit the elevator, immediately turn right and right, again. You will see the entrance to the Speech and Hearing Resource center in front of you. Please check in at the front desk, and we will be happy to help you. 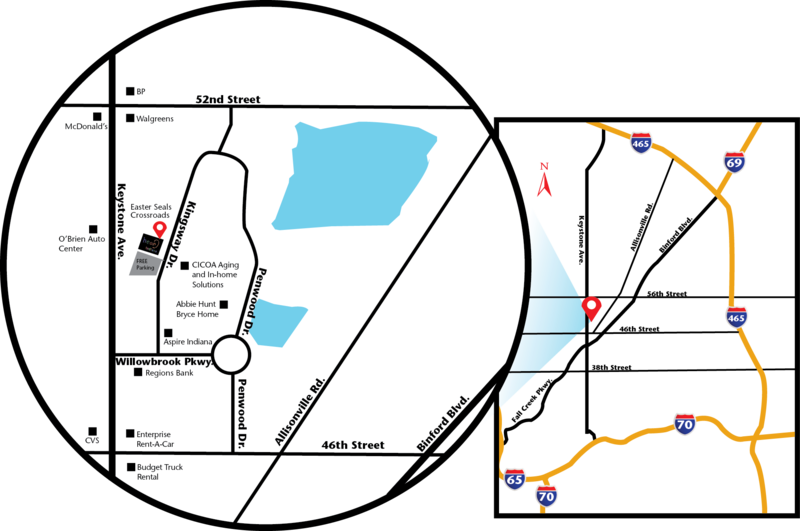 If you plan to utilize IndyGo, route 19 runs right by our building for your convenience!